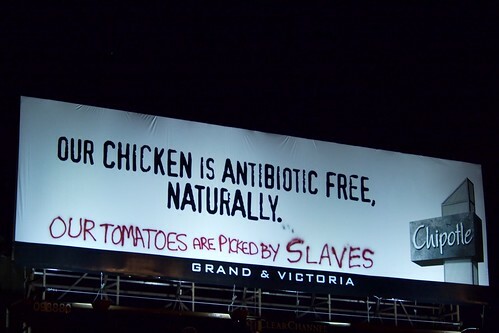 Chipotle Billboard Defacement in Macalester-Groveland: "Our tomatoes are picked by slaves"
A passerby remarked, “I love my slave tomatoes; I like their price,” while I was making this photograph. Is this claim true? Googling for “Chipotle Slaves”, “Chipotle human rights” and other such combinations did not turn anything up. College students with too little to do, or an important message?